Who will win the Samba Gold 2012? The fifth edition of the Samba Gold trophy is upon us, with no clear favourite presenting himself ahead of the vote. It's back! The Samba Gold trophy returns to celebrate its fifth anniversary. In 2008, it was AC Milan's Kaká who dominated the contest from the start. 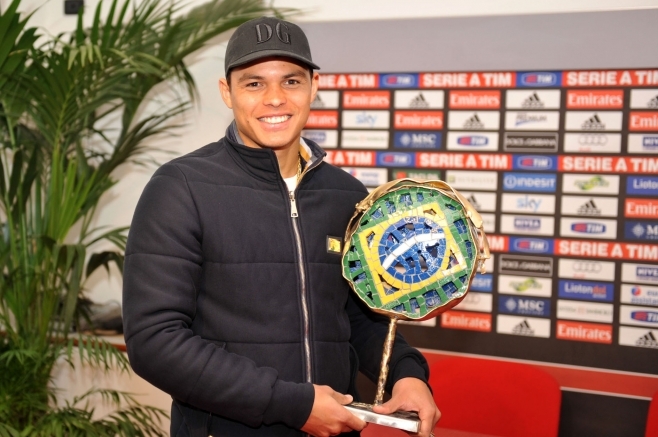 After, Luis Fabiano (Sevilla) in 2009, Maicon (Internazionale) in 2010 and Thiago Silva (AC Milan) in 2011 who raised the trophy and added the accolade to their individual honours. The Premier League has four nominees amongst the 30-man shortlist for the 2012 Samba Gold trophy, including two players from reigning European champions Chelsea. While it may have been too soon for new-boy Oscar to squeeze himself onto the shortlist, team-mates Ramires and David Luiz have both made the list for their performances over the past year. Both players played an important role in the club's success in European football's biggest competition, as well as helping Chelsea to secure an FA Cup triumph under Roberto di Matteo. Elsewhere, Tottenham midfielder Sandro has also earned himself a place on the shortlist, having made himself a permanent feature in the Spurs starting eleven and earned plaudits for his impressive displays. Likewise, Manchester United full-back Rafael is another Brazilian who has had a fine calendar year and is in contention for the award as recognition of his efforts. The youngster has played more minutes than any other Red Devils player so far this season and been roundly praised for his mature displays at right-back. Going around the rest of Europe, it is Spain that leads the way for nominees with a grand total of seven players on the shortlist (Adriano, Dani Alves, Filipe Luis, Miranda, Marcelo, Jonas and Diego Alves). Somewhat surprisingly, though, it is Ukraine who offer the second most candidates with six players in contention (Alex Teixeira, Fernandinho, Willian, Giuliano, Cleiton Xavier and Taison). Moving around the rest of Europe: Portugal present four players for consideration (Alan, Lima, Maicon, Fernando), France have three players on the shortlist (Thiago Silva, Nenê, Hilton), while Germany also have three contenders amongst their ranks (Luiz Gustavo, Diego, Dante. Italy, Russia and Turkey offer one sole candidate apiece (Hernanes, Felipe Melo, Hulk). In 2012, several of the biggest stars of Brazilian football didn't show up. Despite his return to the Seleção, Kaká played little for Real Madrid, while Robinho has had a relatively anonymous year after suffering from injury problems. His problems, though, pale in comparison with Alexandre Pato who also misses out on the shortlist after yet more time on the sidelines, while former Inter Milan full-back and former Samba Gold winner Maicon has featured little since his summer move to Manchester City. Oscar has impressed since arriving at Chelsea this summer, but has not had enough time to press his case for inclusion. Both Oscar and future PSG player Lucas Moura will no doubt be eyeing a place on the shortlist for the 2013 award. As with every year, the election will be composed of three voting groups: the internet users of the world (more than 115000 voted in 2011), eleven former players of the Brazil National Team (Cafu, Rai, Carlos Alberto Torres...) and also eleven journalists specialised in Brazilian and European football, last year including the BBC's Tim Vickery and ESPN regular Andy Brassell.